Here are some example toys, with source code. Click on the image or title of an example to run it. 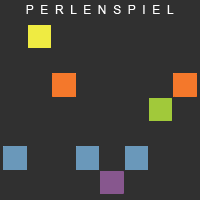 Perlenspiel 3.3 works best on the latest Windows builds of Chrome and Firefox. Safari seems to behave okay on OS X desktops and laptops. Microsoft Edge under Windows 10 is (still) sufficiently non-HTML5 compliant to make it a dubious choice for developing or running Perlenspiel games. Sadly, the browsers in most mobile devices running Android or iOS do not support playback of more than one sound file at a time. There are also hard-to-pinpoint issues with animation timing. These problems will cause many Perlenspiel games to behave badly, or simply break. Plays the opening theme of J.S. Bach’s Die Kunst der Fuge (The Art of Fugue, 1751). Touch the beads to hear the notes again. Source code. Click on the sky to make raindrops fall. Source code. 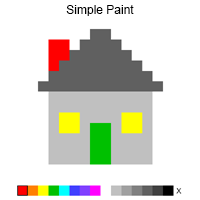 Select colors, click and/or drag to paint. Click X to clear the canvas. Includes an example cover page. Source code. 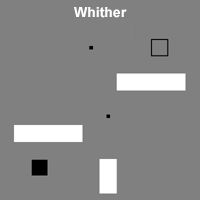 Somber, minimalist puzzler with resources that dwindle and fade. Includes cover page and custom music. Source code. 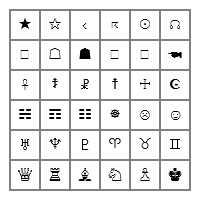 Utility for displaying the Unicode characters (and associated hex codes) available to Perlenspiel designers. Source code.